Do an Internet search for “Remington Registry” and you’ll have no difficulty finding out what kind of scam artists they are. To start, try this Facebook page. They purport to be an impressive source of biographies. 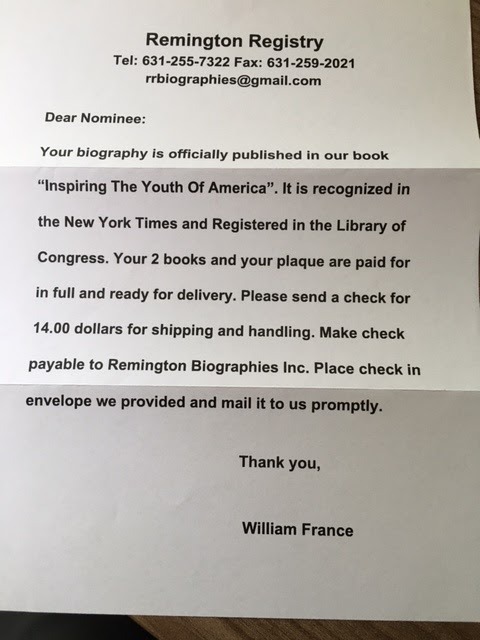 All “Registered in the Library of Congress” means is that they sent a copy to the Library of Congress. I have no idea what they mean by “recognized in the New York Times,” but you can be sure the NYT does not use it for reference purposes. They never talked with me. Given that they have a gmail address, I assume this is a small group, perhaps even one person, who has found a profitable way of preying on the gullible. The mailing address is a house at 22 Dellaria Avenue, Southhampton, NY 11968. Since that’s an expensive neighborhood, I assume there are lots of gullible people who fall prey to this scam. The only happy part is that they sent me a stamped return envelope, which will save me postage writing to someone else. As technology developed to allow scoundrels to ignore the “Do Not Call” list I began getting two or three junk calls a day. For those with cell phones, there are a variety of apps that well help block the increasing number of calls there. I use Whoscall for the iPhone, but there are a variety of possibilities. There is good news on the magazine scams front. The State of Oregon recently settled their lawsuit against the White City scammers for $3,000,000. Since four other states have outstanding lawsuits against those scoundrels, more good news may be on the way. The details of the Texas suit against the White City scammers are here. The State of New York filed suit against the White City scammers in March 2015. Turns out Wisconsin beat Oregon in filing a suit against Laura Lovrien and the White City scammers. There papers were filed at the end of November 2014.